It has been a month but it feels like we’ve known each other for a long time. It is wonderful to know that in this world somebody cares and loves more than you love them. 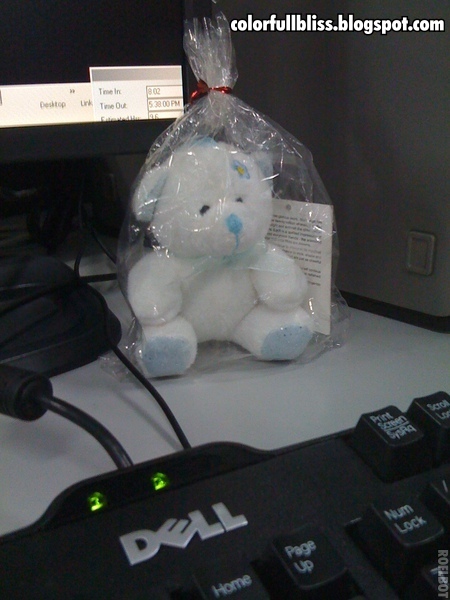 Thanks for this cute little gift you had given me for Christmas! Our little baby.. I sure will take good care of her. Just that I thought of takin her with me at work. Look at her o! All wraped in plastic.. hehe.. But don’t you worry she still can breathe! Lolz! A closer look at Evee.. The sight of her not only brightens my station but my day as well!